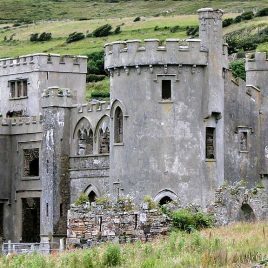 Clifden Castle was built by John d’Arcy in a Gothic Revival style in the 18th century, about 1750. The house was only lived in for about 90 years before it was abandoned in the 1840′s. Few photographs remain of this one time noble house but they can be seen in some of the local history books or in the town’s library. Just ask for them. The house fell into ruin and was stripped bare of anything that could be sold by the locals in order to feed themselves. One of the interesting features of this property are the standing stones. D’Arcy had these stones erected to mimick other standing stones around Ireland. Today little remains of the house but its shell. You can walk through the house through an entrance through the back garden, as the front entrance is inaccessible because of a steep drop into the structure.